Ugly Wristband Recharges Your Gadgets. | OhGizmo! Ugly Wristband Recharges Your Gadgets. Don’t you hate it when you see one of those good ideas that’s been poorly executed? I believe that this Orca PowerStrap falls into that category. Imagine, if you will, a fashionable bracelet that houses a battery. 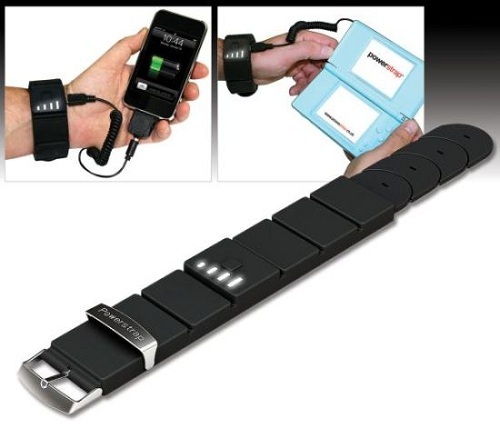 You can plug in a variety of mobile gadgets into the bracelet to recharge them while you’re using them. Sounds pretty neat, right? Enter the $65 Orca PowerStrap. It’s everything mentioned above, minus the word fashionable. Rather, it is big and ugly. I understand that batteries can only be made so small before they’re unable to hold a decent charge. However, if the product isn’t something you’d want to wear most of the time, it really defeats the purpose.